Your personal invite form Juanita N. Henderson is the owner and founder of Chocolate Kinks & Kurls hair. Candid Conversations about Hair & Beauty! 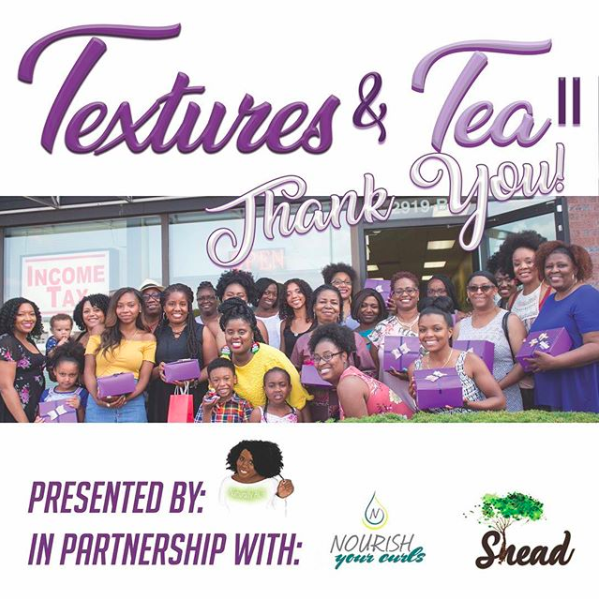 Textures & Tea offers a candid, authentic talk about hair and beauty. Lavender oil is one of my favorite essential oil because of its ability to calm. It’s often used in aromatherapy, known to help with stress, anxiety, acne, and even respiratory problems. Many don’t realize it also has great benefits for all hair types as well. Lavender oil prevents hair shedding and improves blood circulation on the scalp which aids in hair growth. Add Lavender essential oil to your deep conditioner for a nutrient boost. For scalp massage, mix 8-10 drops in 2 Tbsp of warm extra virgin olive oil or coconut oil. Work it into the scalp with your fingers. I personally have used this as a pre-poo treatment, I leave it on my hair overnight to maximize its healing and nourishing properties while helping me sleep. Lavender oil relieves stress providing restful sleep. You can cover your head with a head wrap or bonnet when you sleep, this makes a perfect overnight treatment be sure to wash your hair in the morning. Do you suffer from an itchy, dry scalp? Lavender oil has powerful antiseptic qualities treating dry scalp, fungi, bacteria, and other microbes. Massaging your scalp with a mix lavender oil can help. Add few drops of lavender oil to any carrier oil like jojoba oil, coconut oil, or extra virgin olive oil. You can also add a few drops to your favorite shampoo, conditioner, or deep conditioner. If you wear wigs try applying the lavender and coconut oil or jojoba oil-mix to your hair to help keep your scalp nourished underneath. I believe Lavender oil is a must-have essential oil for improving your hair, skin, and overall health. Consider adding lavender oil to your daily regimen. Disclaimer: Always dilute the essential oil with a carrier oil. ☆ Do you want more information on essential oils? ☆ Have you tried essential oils? Which ones are your favorites? This edition of curlBOX Natural was loaded with full-size products from Honey Baby Naturals. The key ingredient in every product is honey to moisturizer and strengthen your curls; I would even recommend it for your little ones. This curlBox natural did not disappoint! This is sulfate-free shampoo that includes a blend of honey and chamomile to help soothes the scalp for a relaxing wash day experience that also restores moisture to the hair and dry scalp. Creamy conditioner that is infused with a blend of milk protein and honey designed to help hydrate coils and curls days after washing. With ingredients like honey, shea butter, coconut, olive, sweet almond, sunflower seed, jojoba and carrot oils that promote hair glow. This smoothie smells delicious and provide great curl definition! As a natural with tight coils, a good Detangler comes in handy and this formula melts the knots allowing fingers to glide right through with minimal tangles. It’s also serves as a lightweight leave-in and can be used for daily maintenance on re-twisting and many other styles.